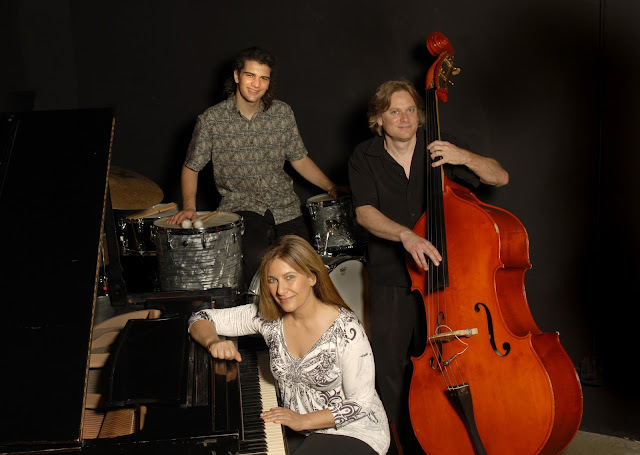 WILLIAMSPORT, Pa. – The Jenny Wilson Trio, a family of jazz musicians, will perform at Lycoming College on Nov. 8 at 7:30 p.m. in the Mary Lindsay Welch Honors Hall on the Lycoming College campus. Jenny Wilson, a notable jazz pianist and composer, will lead the trio in a selection of her original music, as well as jazz standards. The event is sponsored by “Brilliant Corners,” Lycoming College’s national literary journal founded in 1996 by Sascha Feinstein, Ph.D., professor of English at Lycoming, and is free and open to the public. Wilson studied under composers Don French and Grammy-nominated Roswell Rudd while pursuing a degree in contemporary music. She also studied with jazz pianist Art Lande, a collaboration that would eventually inspire Wilson to move to Europe where she toured and taught in Germany, Austria and Switzerland. During her 12 years in Europe, Wilson made a name for herself as a distinguished jazz pianist, vocalist and composer. She performed with local and American jazz musicians, was featured at the Zurich Jazz No Jazz Festival, and appeared in Germany’s Jazz Zeitung magazine. Her original music is said to have a European jazz influence due to her time spent with Lande and abroad. Recent concert performances given by the Jenny Wilson Trio include the Timucua Center for the Arts in Orlando, Fla., the Open Studio in Englewood, Fla., the Stifel Fine Arts Center in Wheeling, W.Va., the Tamarack Arts Center in Tamarack, W.Va., and Concerts in the Loft in Morgantown, W.Va. The Jenny Wilson Trio is comprised of Wilson, her husband Nathan, a seasoned bassist, and son Evan on the drums. Wilson and her husband are performers for the West Virginia Jazz Society, and are the current musicians-in-residence at the Eddie V’s restaurants in both Pittsburgh, Pa., and Tyson, Va.
Nathan is responsible for recording the trio’s CDs, and is a longtime member of the Squonk Opera in Pittsburgh, Pa. When he is not playing with the family trio, Evan can be found drumming with several jazz musicians in the Washington, D.C., area, and touring with the band Electric Love Machine. Founded in 1812, Lycoming College is one of the nation’s oldest and most respected liberal arts colleges. Today, our community of 1,300 active learners from 29 states and territories and 24 countries work with our renowned scholars to craft customized, market-driven majors, minors and concentrations across our 60+ academic programs. These students also compete in 17 NCAA Division III sports and study abroad in more than a dozen countries. Lycoming College has one of the highest endowment-per-student ratios among Pennsylvania colleges and is ranked by Forbes as among the very best for financial strength and operational soundness. Learn more at http://www.lycoming.edu.